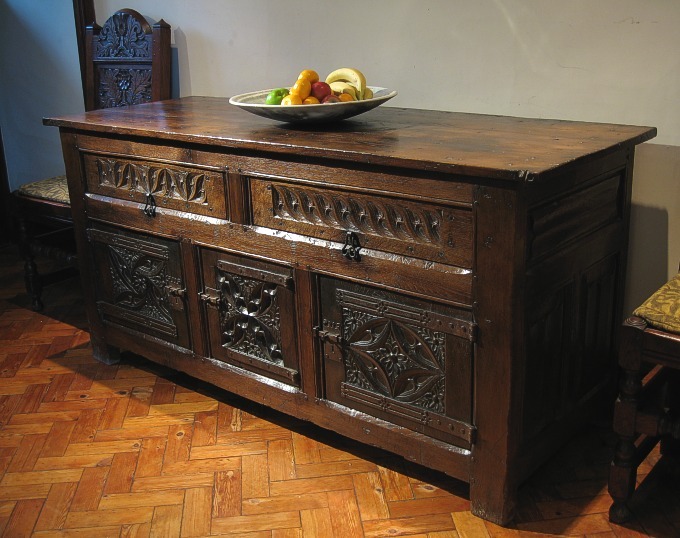 AN EARLY 16TH CENTURY STYLE OAK CUPBOARD. Handmade from reclaimed ancient oak and produced to our clients specific size requirements. We believe this piece represents the pinnacle of what can be achieved in replica early oak furniture. Meticulous attention to every detail, both inside and out, has been applied, from concept right through to the aged and patinated surfaces. The mix and arrangement of framework edge treatments (scratch stock mouldings, bead mouldings, spokeshaved run-out chamfers) bear all the hallmarks of joined enclosed furniture of the Tudor period (from the relatively few pieces that have survived). The hand-carved tracery panels of unsymmetrical application, parchment-fold side panels and pierced decorative ironwork are all, again, 'of the day'. Apart from it's utterly convincing authenticity, what also makes this piece so special is that we have effectively built-in a 'history'. Click on the thumbnails at the bottom of this page to find out more. With grateful thanks to Lindsay Gordon (Assistant Conservator of Furniture, Burrell Collection, Glasgow), for her invaluable assistance during research for this project. Note: We also made the carved Lancashire style chairs, shown below. Our clients future plans include replacing the wood block floor with stone slabs.